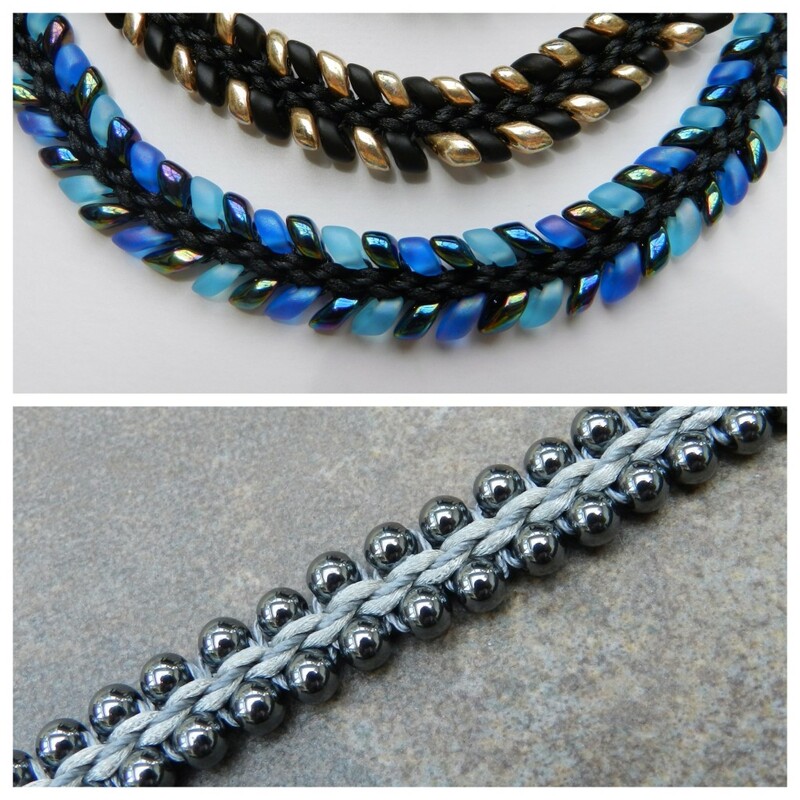 The size and shape of the 4mm round bead works extremely well in kumihimo braids. It can be braided into the braid or it can be sewn onto the braid after braiding. They are available in all of the popular semi-precious gemstones and tend to be reasonably priced. However, there are some challenges associated with working with these beads. The shape can allow a large amount of cord showing in the braid and can also leave a gap in the middle of the braid, leading to a loose feel to the braid. Faceted rounds tend to braid slightly better than smooth rounds and the loose effect can be avoided by braiding around a core or adding in extra cords to fill the void. – Even drill holes. If the beads are bought in a strand, hold the strand up and let it hang vertically. Any deviation from the vertical suggests irregular drill holes. – Hole size. Most 4mm rounds have holes which can easily accomodate a 0.5mm cord, but this may not always be the case. Sometimes keeping it simple is best! Use contrasting colours of gemstone to make a striking pair of bracelets. 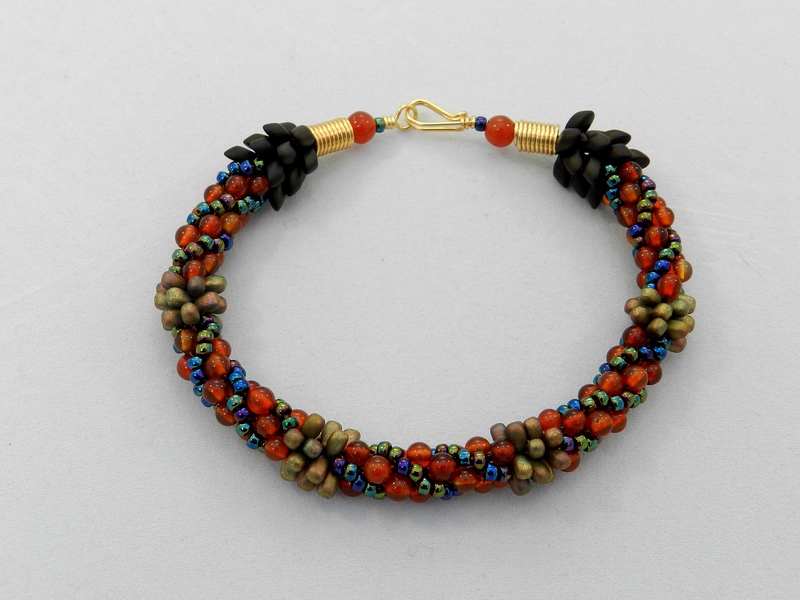 This one is made of black onyx and orange malaysian jade. 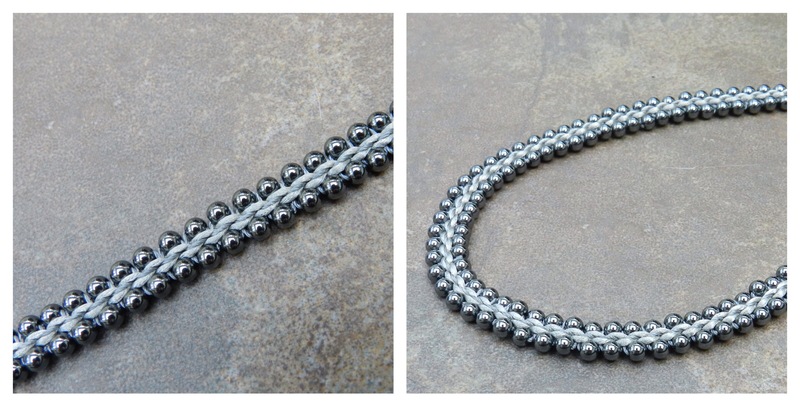 To create a more rigid braid extra cords have been used in the making of this bracelet. Tiny seed beads have been added to create a contrast of scale and to minimise the amount of cord showing. 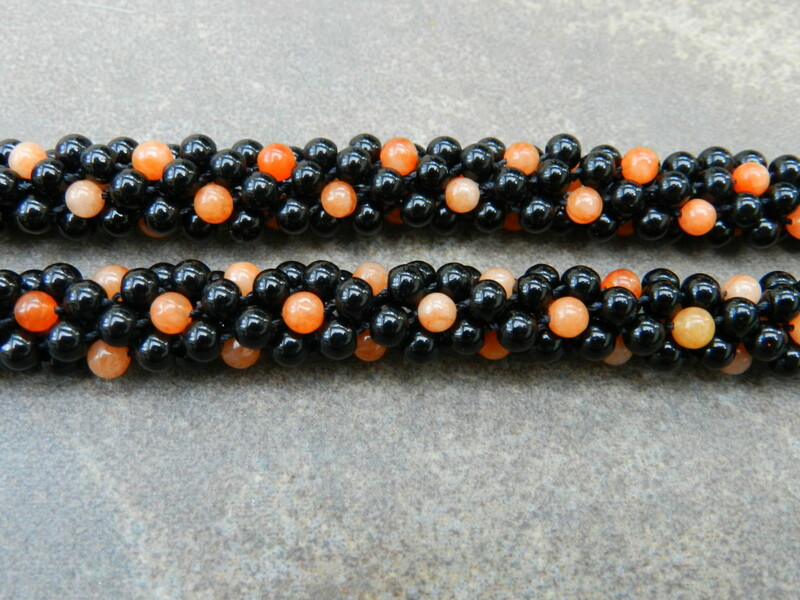 It is easy to substitute 4mm rounds for size 6 seed beads in most designs because they are a similar size. However, they are much rounder, so they will lead to a more textured effect and more cord is likely to be visible. The following suggestions are for designs which are particularly suitable for 4mm rounds. This tutorial was written for size 8 seed beads, which are much smaller than 4mm rounds, however it can easily be adapted to accommodate different sizes of bead. The effect is much chunkier and to keep the weight down fewer netted beads have been made, but the end result is quirky and fun. Please note that a variation of the usual bead placement is used in this tutorial, so it is best for intermediate braiders, who have already completed a few regular beaded braids. 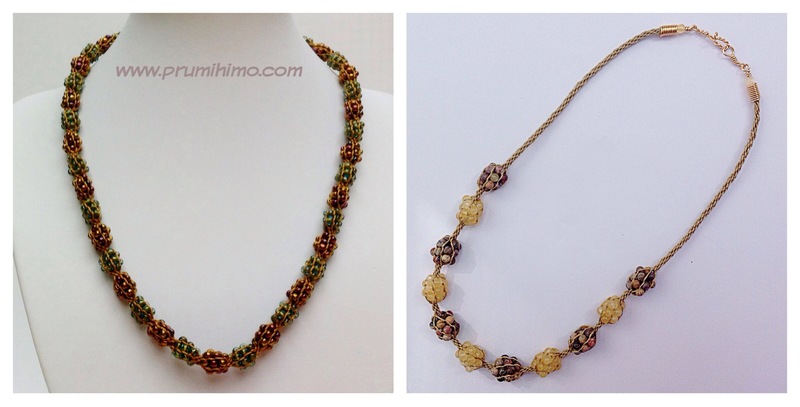 To make this necklace you will need to purchase the Treasure Nets tutorial. Decide how many beaded sections you would like to have and whether you want them to be alternate colours or all the same. Odd numbers work best and either 11 or 13 is a good number. Each beaded section requires 16 beads. Work double the length of braid between the bead nets. 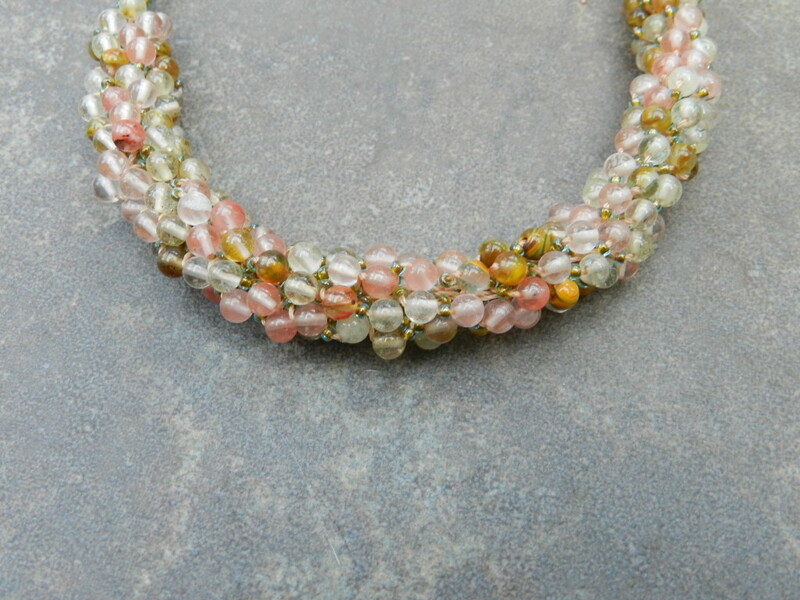 The easiest way to make the necklace long enough is to allow a longer braid without beads at the beginning and end, as seen in the neutral coloured necklace. 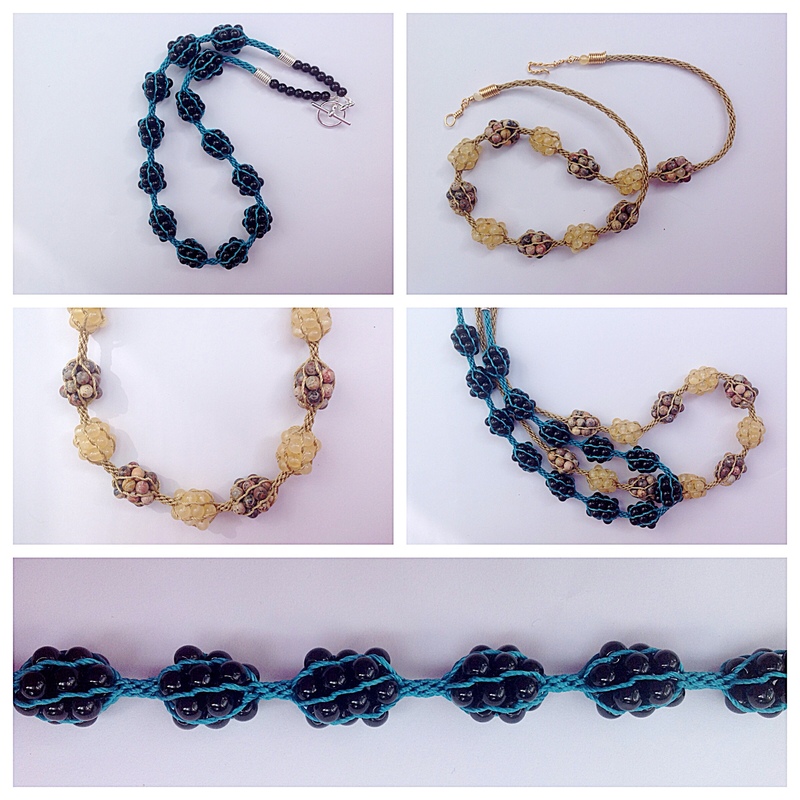 Alternatively, some beads can be strung on beading wire to add length, as in the green and black version. Please contact me via email if you need more assistance to adapt this design. This tutorial is my most popular design. 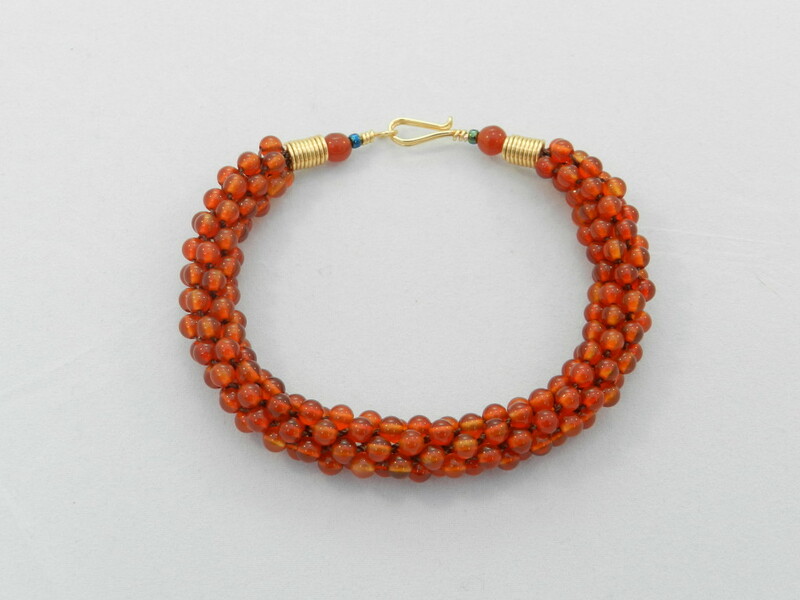 It is very versatile and quick to make and it works really well with 4mm round beads. Please note that an alternative braid structure needs to be learnt, so it is best to have made a few braids in basic round braid before attempting this design. To make this design you will need to purchase the Feathers tutorial. Just use 4mm round gemstone beads in place of the magatama beads. In the photographs haematite was used, which produces a wonderfully weighty, but fluid braid. A tutorial for this gemstone bracelet will soon be available.